Yarn and Fiber Happenings: Kauni Effektgarn Wool Yarn is here! And it is gorgeous! Kauni Effektgarn Wool Yarn is here! And it is gorgeous! The Kauni Effektgarn wool 100% 8/2 is hot out of the box (well actually it is a good thing it is wool to keep itself warm - the yarn was really cold coming out of the box) but it is a here finally! Yeah! We have started putting the colors up on line (we have all the colors by the way) and the first one up is the reds - each skein is going for $16.99 per 150 grams. 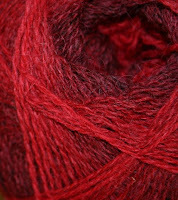 It is crazy yarn and I am looking forward to making a fair isle sweater with it! We also have the Ruth Sorenson Patterns printed and for sale as well as some Kauni pattern catalogs. All should be online hopefully tonight, or if you can, stop by and see it in person!